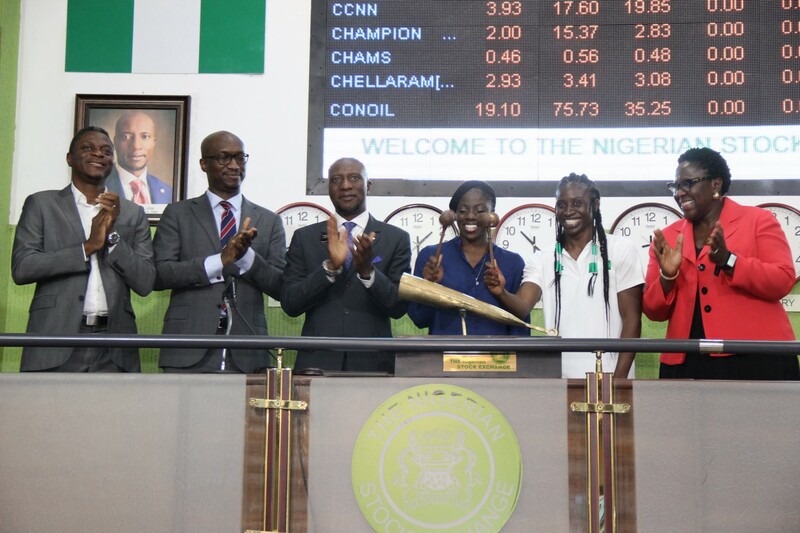 Koye Sowemimo, head sport, Temple Management; Bola Adeeko, head, Shared Services Division, The Nigerian Stock Exchange (NSE); Oscar N. Onyema, chief executive officer, NSE; Seun Adigun, the Olympian and captain of Bobsled and Skeleton Federation; Simidele Adeagbo, Olympian and skeleton athlete, and Tinuade Awe, executive director, Regulation, NSE, during the closing gong ceremony in commemoration of the first African and Nigerian bobsled team and a skeleton athlete to participate in a Winter Olympics,in South Korea, at the Exchange. The Nigerian equities sustained week opening positive performance Tuesday as benchmark index, the NSE All-Share Index (NSEASI) gained 0.2 percent to settle at 43,609.77 points while YTD return expanded to 14.0 percent. Specifically, stocks gained N34.4 billion in value as market capitalization increased to N15.7 trillion. The day’s performance was majorly due to positive sentiment in UNILEVER (+10.2%), SEPLAT (+3.3%) and DANGSUGAR (+4.9%). Market activity level strengthened as volume and value traded rose 76.8 percent and 3.8 percent to 445.5 million units and N5.9 billion respectively. The top trades by volume were STERLING (101.9m), FIDELITY (49.2m) and ZENITH (37.9m) while GUARANTY (N1.5bn), ZENITH (N1.2bn) and NESTLE (N741.9m) were the top trades by value. Performance across sectors was largely positive as all indices closed in the green save for the banking index, which shed 0.3 percent following losses in GUARANTY (-1.7%), ACCESS (-2.2%) and STERLING (-4.6%). Conversely, the oil & gas index was the top gainer for the second consecutive session, inching 1.4 percent higher as sustained interest in SEPLAT (+3.3%) and JAPAUL OIL (+8.7%) continued to drive performance. Also, the consumer goods index (+0.9%) trended northwards, on account of upticks in UNILEVER (+10.2%) and DANGSUGAR (+4.9%) while the insurance index improved 0.1 percent following price appreciation in NEM (+1.7%) and CONTINSURE (+1.2%). The Industrial Goods index marginally increased 1bp on the back of gains in CCNN (+0.8%). Investor sentiment as measured by market breadth (advance/decline ratio) weakened to 0.9x from 1.3x recorded the previous session consequent on 26 stocks advancing against 29 decliners. The top performing stocks were UNILEVER (+10.2%), CAVERTON (+9.9%) and JAPAUL OIL (+8.7%) while REGALINS (-9.1%), MULTIVERSE (-7.4%) and WEMABANK (-5.0%) were the worst performers. “Despite weaker investor sentiment, market performance remained positive. Hence, we anticipate a sustained uptrend in subsequent trading sessions as investors continue to take position in anticipation of positive corporate earnings,” said analysts at Afrinvest. In the NASD OTC Market, the SDIGIPLC, SDCAPDBETO, SDAFRILAND and SDFCWAMCO were the only stocks that traded, with a total volume and value of 15,100 units and N230,452 respectively.